On occasion, some of the potatoes we receive from farms and deliver to the Boston Organics Community have "hollow heart," a discolored hole in the center of a healthy potato. Don't worry, our potatoes aren't sad. 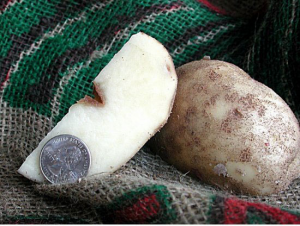 Hollow heart occurs when the potato grows too quickly and tears itself apart, often due to excessive moisture in the soil from too much rain or improper watering. Hollow heart potatoes are still edible and safe to eat, as long as the splitting hasn't reached the surface, which can then invite rotting. If you find yourself with hollow heart potatoes, you can cut out the hollow piece and eat the good parts! If you encounter any issues with potatoes received from Boston Organics, please let us know so that we can make it up to you. Feel free to contact us with any questions about this. As always, thank you for your support, and happy eating! Unlike traditional farm share programs, we deliver year-round, we're extremely flexible and you get to pay as you go. We don't charge you fees for any standard service offerings, including delivery to your doorstep. There are no advance commitments. Only pay for what you receive. We're all about serving the Boston Organics Community and we aim to please with our service guarantee.